On November 18th, 1967, Private First Class Davis's artillery unit was hit by a massive enemy offensive. At twenty-one years old, he resolved to face the onslaught and prepared to die. Soon he would have a perforated kidney, crushed ribs, a broken vertebra, his flesh ripped by beehive darts, a bullet in his thigh, and burns all over his body. Ignoring his injuries, he manned a two-ton Howitzer by himself, crossed a canal under heavy fire to rescue three wounded American soldiers, and kept fighting until the enemy retreated. His heroism that day earned him a Congressional Medal of Honor-the ceremony footage of which ended up being used in the movie Forrest Gump. You Don't Lose 'Til You Quit Trying chronicles how Davis's childhood in the American Heartland prepared him for the worst night of his life, and how that night set off a lifetime battling against debilitating injuries. But he also battled for his fellow veterans, speaking on their behalf for forty years to help heal the wounds and memorialize the brotherhood that war could forge. 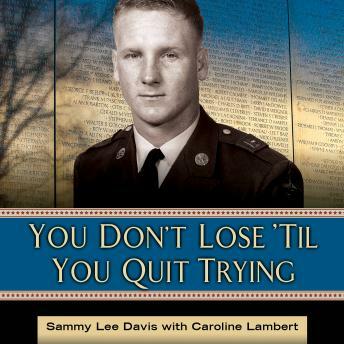 Here, listeners will learn of Sammy Lee Davis's extraordinary life-the courage, the pain, and the triumph.